Apple launched three new iPads in 2017, in 9.7in, 10.5in and 12.9in sizes, and has already announced a new 9.7in iPad for 2018. (We discuss their respective merits in our iPad buying guide.) But our thoughts are already turning to the next generation of iPad Pro, and if the reports are to be believed it could launch at WWDC this summer. In this article we gather the rumours about the new iPad Pros we'll see in 2018, covering their specs, features, pricing and release date. The most recent iPad Pro models were announced at WWDC 2017 on 5 June 2017 and are available to buy here. It's reasonable to expect that Apple will make announcements relating to the third generation of iPad Pro at WWDC 2018 (confirmed for 4 June). In fact, Rosenblatt Securities analyst Jun Zhang told investors in March 2018 that he thinks Apple will unveil a new full-screen iPad Pro with Face ID in June 2018, reports Apple Insider. Sources quoted by Bloomberg in November 2017 predicted, that new iPads with Face ID would be released "a little more than a year after the last major iPad Pro upgrade" indicating that WWDC would likely provide the platform for launch. In the U.K., 10.5in iPad Pro starts at £619 for the 64GB with Wi-Fi model and £749 for the 64GB Wi-Fi + Cellular model; while the 12.9in iPad Pro starts at £769 for the 64GB Wi-Fi model and £899 for the 64GB Wi-Fi + Cellular model. You can order the new iPad Pro models here. Apple bumped up the prices in the UK as the pound weakened following the Brexit referendum result, and we fear that prices may rise again - if the pound continues to struggle, or if Apple decides to bring in an iPhone X-esque edge-to-edge screen, or both. With the release of the iPhone X at the end of 2017, it is looking likely that the iPad Pro design will take inspiration from that phone - so you can expect to see the famous Notch, and no more home button. But what else is likely to change in terms of design? We investigate below. Apple is expected to bring across some of the design changes from the iPhone X to the iPad lineup in 2018. Bloomberg's sources back in November 2017 expected "at least one" new iPad model to ditch the Home button and go for an edge-to-edge screen, replacing Touch ID with Face ID. The sources didn't expect this screen to be OLED, however. They don't say why not, but after the production difficulties (and supply shortages) that the iPhone X's OLED screen seemingly caused, the company may be shy of going all-in on the technology just yet. Back in October 2017, KGI Securities analyst Mini-Chi Kuo predicted that the new iPad Pro would include the TrueDepth Camera for Animoji and Face ID. It seems that by removing the home button and slimming down the bezels the new iPad Pro model will enable Apple to push the screen size of the 10.5in model closer to 11in, alternatively, it may keep it the same size while shrinking the chassis. Indeed, a Chinese report claims that an 11in iPad Pro is on the way, along with the 12.9in version. That suggests that the larger 12.9in iPad Pro would be no larger than it is currently - but it may be the case that Apple is able to make the dimensions of that model smaller while still accommodating the larger screen. In Feb 2018 Apple was granted a patent, spotted by Patently Apple, for "Dual display equipment with enhanced visibility and suppressed reflections". 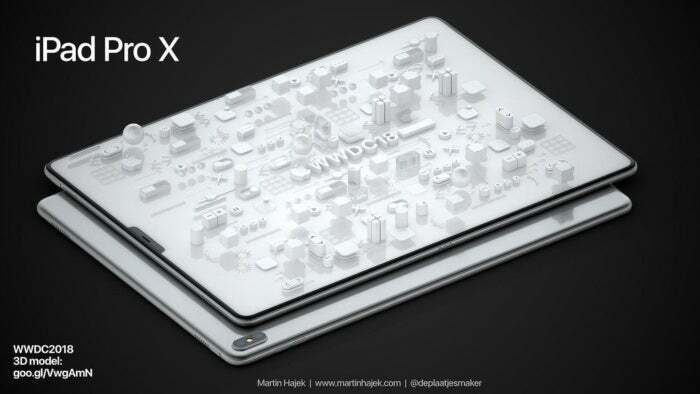 That's quite a mouthful, but if you check out the details it reads a lot like a second display for an iPad or Mac - one that would be used for a software keyboard. There are two applications, one with the second display connected to the body permanently and movable via a hinge, and the other allowing it to be removed and reattached as required. It seems likely that this second screen would be used as a touchpad-style keyboard. There are also suggestions that it could be used with the MacBook in the future. As ever we must caution readers that patent activity sometimes results in product development many years down the line, and sometimes results in nothing at all. It's unlikely that we'll see anything from this in 2018, although it's an interesting train of thought for Apple to be riding. It's too early to expect any leaked photos or factory shots, but we're seeing the first concept illustrations of the 2018 iPads. 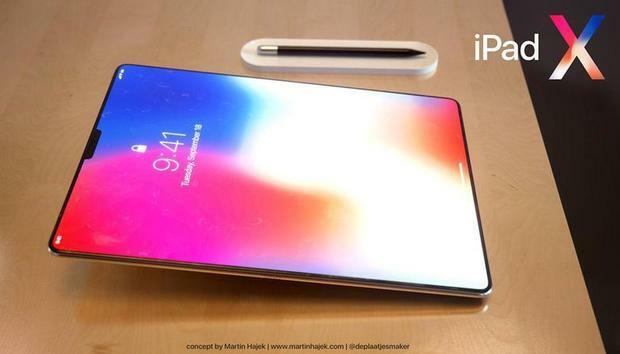 Remember that these are entirely unofficial: they're designs that people unconnected to Apple have come up with as a way of visualising the most popular rumours. Hajek has released a number of image sets on this theme. In an earlier set he also chucked in a smart new Apple Pencil that looks great in black and silver. Let's look next at the internal changes in the new iPads. iPad Pro models generally include a modified version of the processor in the preceding iPhone - last time around the iPhone 7 came out with an A10 Fusion chip, and the iPads got an A10X Fusion. The iPhone 8 and iPhone X both come with the A11 Bionic processor, so we'd expect the iPad Pro models released in 2018 to feature a slightly souped-up A11X Bionic - although the A11 is terrifically fast already.